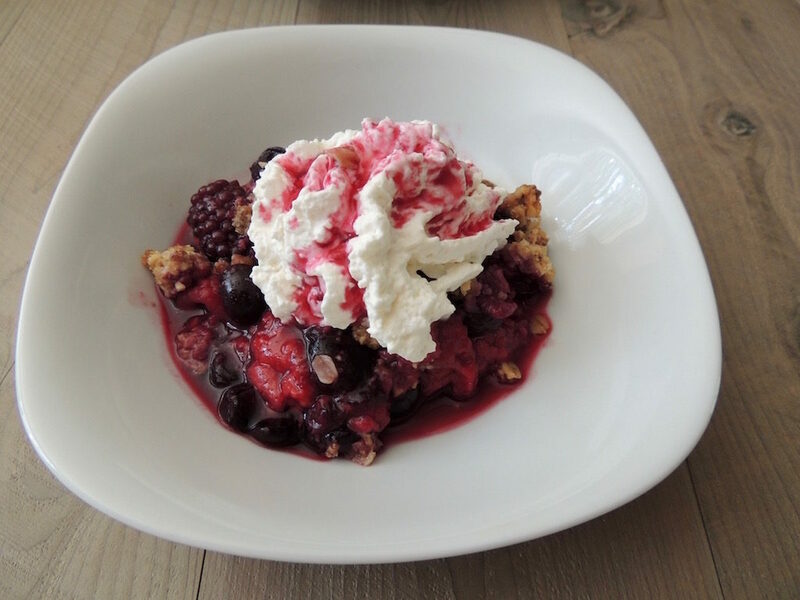 Quick and easy Triple Berry Crisp is versatile. Not only is this a wonderful dessert but it also makes an excellent breakfast. The recipe calls for whole-wheat flour, whole oats, brown sugar, almonds, cinnamon, salt and melted butter for the topping and a bounty of fresh fruit – a great way to start the day! 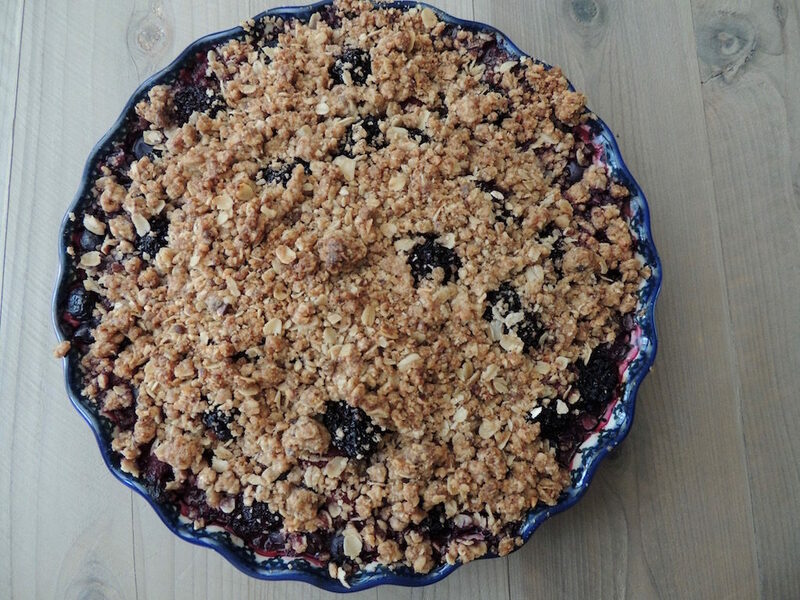 Wash the fruit, drain a little, slide the berries into a deep dish pie pan, cover with the crisp topping and bake for a little over an hour, until the berries are bubbling. No sugar needed in the fruit unless you find it very tart and then I recommend only a sprinkling of a tablespoon or two over the top of the fruit. Make several batches of the topping at once, minus the butter, and keep in an airtight container in the refrigerator. Use 1 ½ cups of the topping mixed with 6 tablespoons melted butter and combine over 7 cups of fruit. Here’s the video, but don’t miss out on the history of the crisp and similar type fruit desserts below! Bird’s Nest Pudding, Brown Betty, Buckle, Cobbler, Crisp, Crumble, Grunt, Pandowdy, Slump, Sonker – all names and variations on “old-fashioned” English and Colonial American fruit desserts. If old-fashioned means out of date, I beg to differ. These recipes are wonderful ways to make use of abundant seasonal fresh fruit and are not just for dessert. The common denominator is the recipes all use fruit, sweeteners, and usually have a crusty top. What varies is the type of fruit, though apples predominate, and the type of pastry that covers the top or on occasion is broken up and mixed into the fruit bottom. Names are regional and somewhat like barbecue, each style is fiercely defended. The sonker has its own festival in Lowgap, North Carolina and proudly touts the abundance of fruit contained in a sonker compared to a stingy cobbler. Bird’s nest pudding is made with sliced apples covered with a mixture of milk, eggs, and sugar, and baked until set, a custard. 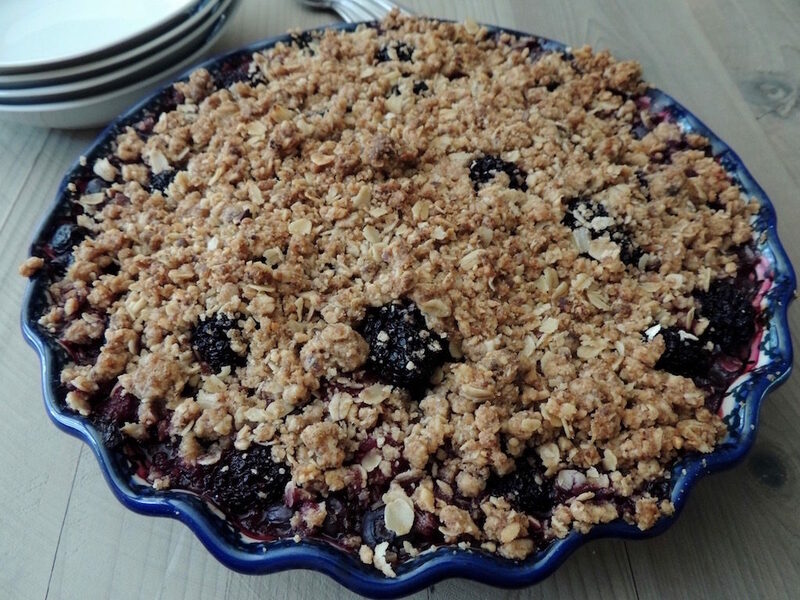 Brown betty has layers of fruit, crumbled pastry, fruit, and crumbled pastry. The crumbled pastry absorbs fruit juices and thickens into a pudding-like consistency. Yellow cake is the base for a buckle with berries strewn across it and topped with crumbs, which is then cut into squares after baking – a precursor to a fruit bar, perhaps. A cobbler is a deep dish dessert covered with thick biscuit dough, either a solid layer, or cut into rounds, resembling cobbles – hence the name – sprinkled with sugar, and baked until golden brown. The thickness of the biscuit overwhelms the dish and is why Sonker fans claim to have a better fruit to crust ratio. Grunts and slumps are stovetop versions of a cobbler, which originated in England. The biscuits are steamed in a cast-iron skillet and resemble dumplings. The noise from the bubbling fruit “grunts” as it stews. To make a pandowdy, the dough is sliced and pressed into the fruit during the last stage of baking. Early recipes referred to this step as dowdying. So many to choose from, but for me it’s an easy choice, the crisp, or crumble as the British say, is my favorite. Fruit on the bottom covered with a layer of flour, brown sugar, whole oats and sometimes nuts that is traditionally rubbed with butter. The butter melts in the oven and “crisps” the top. I find, however, that melted butter added to the dry ingredients does a better job. The fat is totally incorporated into the crust and prevents a partially crisp, partially powdery top. 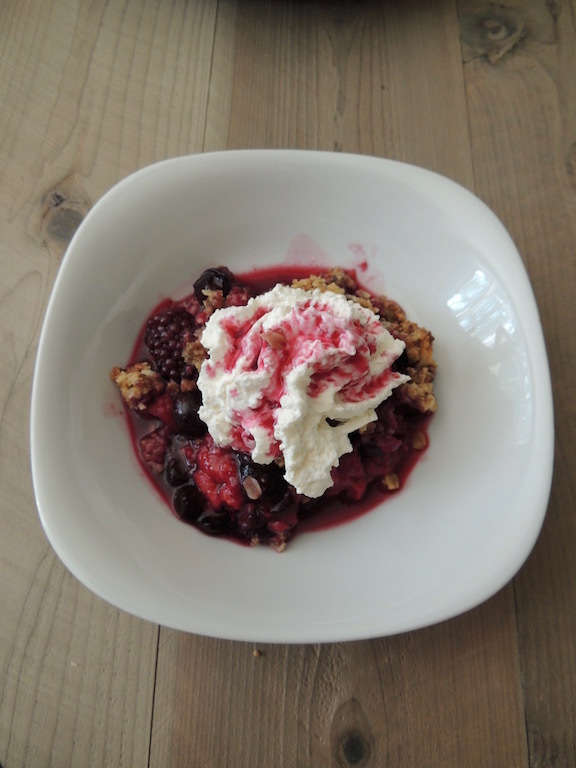 Below is my recipe for Triple Berry Crisp. Not only is this a wonderful dessert but it also makes an excellent breakfast. The recipe calls for whole-wheat flour, whole oats, brown sugar, almonds, cinnamon, salt and melted butter for the topping and a bounty of fresh fruit – a great way to start the day! Slide the berries into a 9-inch deep-dish pie plate. *if you don’t have a deep dish pie plate, use 6 cups fruit. Place the almonds and sugar in the bowl of a food processor fitted with the blade and finely grind the nuts. Add the flour, oats, cinnamon, and salt; pulse just enough to combine the ingredients. Pour the melted butter over the mixture and pulse until well incorporated. Take handfuls of the crisp topping and cover the fruit. Place in preheated oven and bake for 80 minutes or until the fruit begins to bubble. Serve warm or at room temperature with a dollop of whipped cream or ice cream. Use frozen, unsweetened fruit in the off season. Make up multiple batches of the topping, minus the butter, and keep in an airtight container in the refrigerator. Use 1 ½ cups of the topping mixed with 6 tablespoons melted butter and combine over 7 cups of fruit. It’s so quick and easy to make these crisps spur of the moment.